What if I told you that the powerful foursome of Roger Federer, Rafael Nadal, Novak Djokovic and Andy Murray could’ve, should’ve included a fifth member? Someone just as talented as that most famous quartet? What if I told you that this man is taller than all of them, but moves around the court just as well? That he has a very good serve, and was nearly impossible to ace? That he can generate pace off of both wings, while still being extremely consistent? That he can attack, defend and hit absolutely spectacular shots seemingly at will? What if I told you that this man, instead of becoming a rightful member of the elite that has ruled men’s tennis with an iron grip, would only reach a career-high ranking of No. 7 (almost three years ago)? That he would win only 4 of the 20 finals he reached? That all four of his titles are ATP 250s? That he would reach a single Grand Slam semifinal, plus only three other quarterfinal appearances? By now you probably know who I’m talking about. I was watching this individual play Rafael Nadal on TV in the Doha final the other day, and couldn’t help but wonder what could’ve been for men’s tennis if Gael Monfils had turned the Big Four into a Big Five. After all, he’s 27 years old, barely three months younger than Rafael Nadal and eight months older than Novak Djokovic and Andy Murray. And just as naturally talented as anybody we’ve seen pick up a tennis racquet. Don’t confuse this with some sort of takedown of Gael Monfils. That’s not the point at all. But watching Gael find several ways to lose the Doha final made me think about just what makes an elite tennis player, particularly the variables that escape the traditional ways in which we analyze a prospect. The first thing we see when we are trying to figure out how good a player is are the shots, naturally. You look at the serve, you look at the forehand, you look at the backhand. Those are pretty obvious ones to focus on at the beginning. Then you might want to look at a player’s ability to defend. You might want to look at the way said player approaches points: does he/she create any situations that lead to points being won? Do they have the ability to end points on their own terms, a.k.a., do they have a weapon from the back of the court? Do they hit into open space, detect an opponent’s weakness, or simply rally aimlessly? Can they return serve? Do they use different spins and angles to throw their opponent off their game? Do they seek to impose their strengths on their opponents, or do they prefer to deconstruct their opponent’s game by using more subtle trickery? Then you might want to look at other aspects of a player that don’t necessarily have to do with mechanics. For example, what’s their demeanor when facing adversity? When facing prosperity? What exactly do they try to execute (and how do they do it?) when they absolutely must win a point? After a big win, what is their reaction? When they talk to press, what are their ambitions? Do they seem smart? Do they seem hungry for glory? You get the drift: there are endless variables, and who knows which ones should be the essential ones on which to focus. But we can agree that if tennis players need a large toolbox in order to succeed at the highest level, Gaël’s is pretty much stacked. It’s just that he hasn’t been able to do all that much with it. The beginning of the Doha final was somewhat unsurprising to me. Yes, Monfils had beaten Nadal twice at that event (and zero times in their nine other matches), but he’s widely known to be an atrocious title match player (as you may have noticed above, he was 4 and 15 entering last Saturday’s final). When thinking about which trend would emerge victorious, it seemed obvious to me that the latter one (Monfils being bad in finals) would triumph, given that Nadal is a historically great title match player: Doha was the World No. 1’s 61st title out of 86 finals appearances, good for a 71% success rate. Monfils came out frozen. Even though this was his 20th final appearance, and his 11th match against Nadal, he was tight as a drum. He seemed clueless about what gameplan (if one indeed existed) he wanted to execute, and balls were either sailing long or darting into the net before anything happened. Nadal cruised rather easily to a 6-1 lead. The second set showcased all the good things Monfils can do on a court, and he took it. But nobody on this Earth was surprised when Nadal came up with the right shots at the right time in the third set. The first press conference I ever attended was last year, when Gaël Monfils took out James Blake in the first round of the Houston ATP 250. He struck me as a very kind soul, and a very thoughtful man. It’s really easy to see why he’s so well liked by players and fans alike. I remember sitting on the floor, just inches away from the chair upon which Monfils sat, and feeling completely at ease in the presence of this very impressive human being. Days later, I was impressed by Monfils’ precise recollection of the point that lead to his loss to top seed Nicolás Almagro. He was pretty honest about what he did wrong, and the effect that point had on him. And this point didn’t take place at an obvious juncture, i.e. a third set breaker. It was a break point at the beginning of the second set, after Monfils had taken the first. Talent evaluation is notoriously difficult. In team sports, it’s executives armed with endless data who try to figure out which prospect will work out. And even then, the outcome is always unpredictable. In tennis, there is no such thing: players go through matches their whole life, and how they do in them ends up being a pretty clean reflection of their quality. Yes, injuries can disrupt things, as someone like Monfils can attest (though Rafael Nadal has had arguably a tougher injury road to navigate, and look where he’s now), but there’s no General Manager who will “fire” a tennis player because he/she is not producing. Companies must have some sort of method to figure out who’s worth endorsing, but players have made it to the elite without one of these deals (remember Nikolay Davydenko’s plight to land a clothing deal?). So that leaves us, the people who watch the sport, to try and figure out who can be great, who can be merely good, and who will definitely be playing a lot of Challengers or ITFs in their career. And sometimes someone will impress us immensely. Someone seems like an obvious star. Lleyton Hewitt found himself in a pressure-cooker of a situation last Sunday in Brisbane. He was trying to win his first title since 2010, and he was also trying to beat Roger Federer for just the second time in their last 18 matches (strangely enough, Hewitt’s last win over Federer had been in the 2010 Halle final, which ended up being the last event Rusty won before Sunday). Hewitt walked towards the baseline to try and serve out this crucial game, which would clinch a title in his native Australia for the first time since 2005. He had one significant problem to deal with, though: he wasn’t finding any first serves. Rusty served only 49% of 1st serves throughout the match, and if memory serves me right, he was around 47% for the set when he set up to try and clinch the Brisbane title. In addition, Hewitt had gone from being a bully to his frequent tormentor in the first set and a half of the contest, to having to scrape for his life and save seven break points in that deciding set. He had taken the only opening he had seen in that third set, but he now had to capitalize on it. Rusty stepped to the baseline for that first point of that 5-3 game, and missed a first serve. Not a good sign. He then got a decent second serve in, but followed it up with a cheap backhand unforced error. 0-15, and 0-1 on first serves for the game. What happened next? Lleyton Hewitt, the man who finished not one, but two seasons as the highest ranked men’s tennis player, the man who’s won two Grand Slams and beaten just about everybody there is to beat, served not one, not two, not three, but four straight first serves. He won all four points, and by natural consequence, the match. Much is written about what constitutes greatness, but a simple definition might be that great athletes execute exactly what they want in pressurized moments, despite the odds against them doing so. Hewitt’s service performance would indicate that in that crucial game he would’ve played a little under half the points with his first serve. However, he ended up playing 80% of the points with his preferred delivery. And this was World No. 43 Lleyton Hewitt in 2014, not World No. 1 Lleyton Hewitt back in 2002. This made me think about how even when a great player has long ceased to perform consistently at a high level, you catch glimpses of their past excellence here and there. In the first set, Hewitt reminded everyone just why he terrorized the entire tour with his elite return of serve and humiliated plenty with his gorgeous backhand lob winners. He then faded into the struggling player that he’s been for years now. 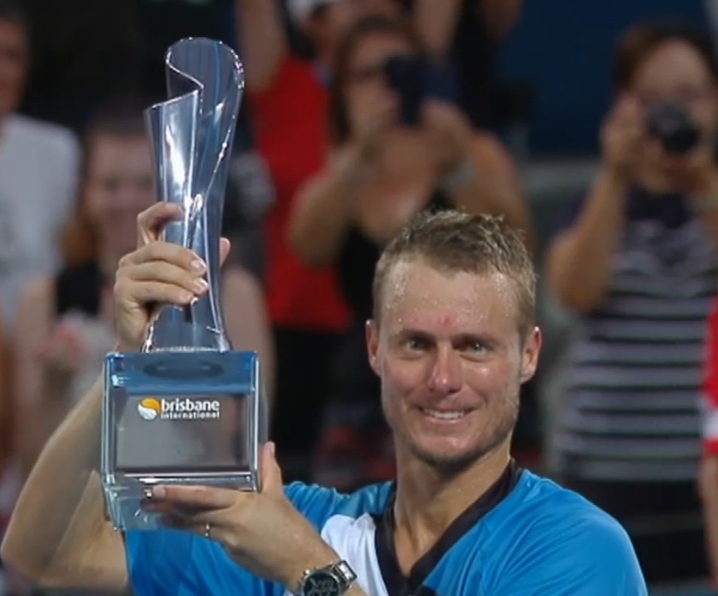 Only to play one great return game in the third set, and then come up with four straight first serves just in time to hold the trophy and flash a weird grin to everyone. As I type this, a very elaborate ceremony is taking place in Melbourne. The draw for the 2014 Australian Open is being made, and on the men’s side, the only question I have in my head is who might stand in the way of the seemingly inevitable Djokovic-Nadal final. The World No. 1 and the World No. 2 ended 2013 in different ways, but they both made sure that the chasm between them and the rest of the tour remain as big as ever. After all, the Serb and the Spaniard combined to win 3 out of the 4 Slams, 8 of the 9 Masters 1000 (which is astonishing), and the World Tour Finals. Andy Murray actually won the remaining Slam and M1000, and he finished the year 6470 points behind Djokovic. In related news, Andy Murray finished 2013 with 5790 points. Rafael Nadal won all three major events right after Wimbledon, and Djokovic won all three remaining biggies to end the year. Make no mistake: they co-own the tour with an iron fist. And they also set up 2014 to be yet another year where they battle to the death for the Slams, the Masters 1000 and that pesky Year-End World No. 1 spot. Their 2013 Head to Head ended up at 3-3, with Nadal winning the two meetings at Slams and Djokovic taking a surprising win in Monte Carlo and then denying Nadal one of the few important titles he’s missing at the World Tour Finals in London. Their overall head-to-head stands at 22 and 17 in favor of Nadal. With all of that being said, I found it fascinating that both men teamed up to earn millions of dollars in South America, all the while having all sorts of fun in some pretty popular exhibitions. This seemed pretty unique to me, but it wasn’t all that surprising. Despite a few minor tiffs between them (and their camps), both men have enjoyed a mostly harmonious relationship over the years. I don’t think they’re best friends (or friends, necessarily). I do think they enjoy playing against each other, since it’s always fun to play against the elite, and it also represents a real shot at improving and seeing just how far your own talent will go. Still, I was amused by the sight of these two crazed competitors having so much fun in the southern hemisphere, while knowing full well that they would quite likely reignite their historic rivalry in just a few weeks’ time. I always find Rolling Stone’s “Guest List” sidebar fascinating. It’s not a complicated concept: a musician who just released something gets to pick five songs and write a little snippet about them. Rush just released a live CD/DVD thing, so Geddy Lee (their bassist/keyboardist/lead vocalist) got the “honor” in Rolling Stone’s last issue of 2013. I deeply identified with this statement. First of all, if you don’t know, “Thick as a Brick” is an unusual song, in that, well, it is also an album. It lasts more than 43 minutes, and the only reason it was split into two was so it could be pressed on the two sides of a vinyl LP (the album came out in 1972). Thick as a Brick was absolutely fascinating to teenage prog-rock fanatic me. I had already seized my dad’s copy of Jethro Tull’s Aqualung by then, and memorized most of that classic album. Then, one of my best friends loaned me a cassette tape of Thick as a Brick he himself had inherited from his older brother. I fell in love with this crazy album, and the subversive idea that you could do something outrageous like releasing a rock album that contained all of one song. I’ve listened to it countless times over the years, but not a whole lot recently. This is why I also identified with Geddy Lee’s use of the past tense. So today I fired up Spotify to check and see if their version has better sound quality than my original CD (it does, given that I bought Thick as a Brick in the mid-90s), and listened to the whole thing again. And my, is it still a remarkable piece of music. Monfils always reminded me of Novak Djokovic. He has the speed and the bendy-ness. He has the occasional killer forehand and serve. He is amazing on the defense, and loves to entertain. Out of all of the “wasted potential” players, Monfils must be one of the most jarringly painful to watch – you can SEE hes got the game, its so obvious! So sick of Rafa not getting the credit he deserves. He never wins a match – the other guy always goofs up and loses it. His 2013 was amazing but instead people are talking about Djokovic and two good months he had after Rafa’s intensity unsurprisingly went down a level or two after winning the important matches during the year and getting the #1 back. The man has the highest winning percentage in history, no player other than Davydenko has a winning h2h against him and that would get resolved in a hurry if the two were ever matched up in a tournament, he has substantial h2h winning records against everyone in the top 10 or top 20 or even top 30 – no other player on tour can say that. He didn’t just have a great 2013, he has had an amazing career, but so many bloggers and journalists claim he is just lucky while players like Fed and Djokovic are praised to the heavens. It’s utterly ridiculous and I wish it would stop.